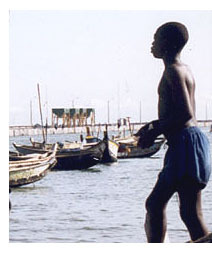 In 1989, after 17 years of rule by Marxist-Leninist dictator Mathieu Kerekou, Benins economy was in a severe crisis. Political opposition to the government was growing. Angered by the states inability to pay salaries and honor scholarships, a movement of students, teachers, university faculty, and union leaders called a strike. The strike, which began in January 1989 and rapidly grew to national proportions, effectively paralyzed Benin. By May, the state-owned banks were on the verge of collapse and the government froze all bank accounts. Kerekou finally agreed to meet with two of the striking university professors. Under pressure to secure foreign aid, he also released many political prisoners from jail. The fall of the Berlin Wall in November 1989 further galvanized pro-democracy leaders. By December, with street protests becoming a daily event and violence escalating, Kerekou abolished Marxism-Leninism as the state ideology and ordered a National Conference to be organized in February 1990. Leaders of the Conference invited input from all over the country, and fought to gain sovereignty for the assembly. Kerekou threatened to oppose this move, but ultimately acquiesced. The entire country was riveted by the proceedings, which resulted in sweeping changes, including the writing of a new constitution and the staging of national, multi-party elections, which took place in March 1991.